How to paint the colour white? 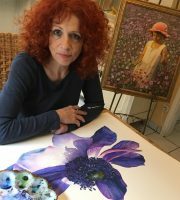 Painting a white subject, like a white rose, other white flowers or a white dress is always challenging and makes the most FUN in watercolor. 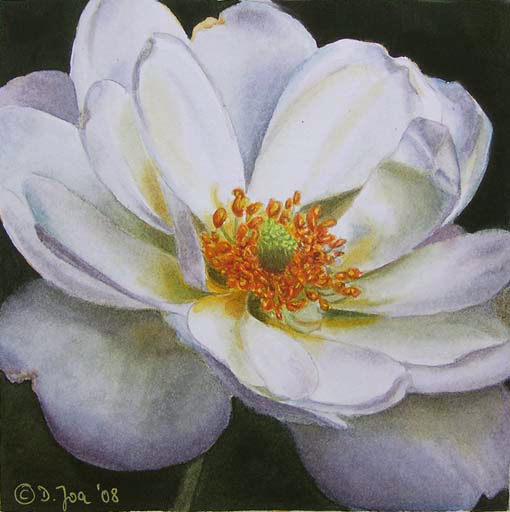 But which colours are the best to paint white and to describe a flower with white petals or a white dress? How to paint the colour white in watercolor or any medium? You can use cool colours to describe the shadows or warm colours. This depends on what you want to say. I love to paint white and have already painted so many white flowers and roses so I can show you some excamples how I described the white subject in my paintings. Usually a nice purple mix is a good shadow colour. A mix of a blue and a red works always well. Using only these two colours allow you to create a warm shadow colour with adding more red or a cool shadow colour with adding more blue. But what if we add some yellow or some orange or maybe a green colour to our shadows? Here are some pictures of some recent paintings. 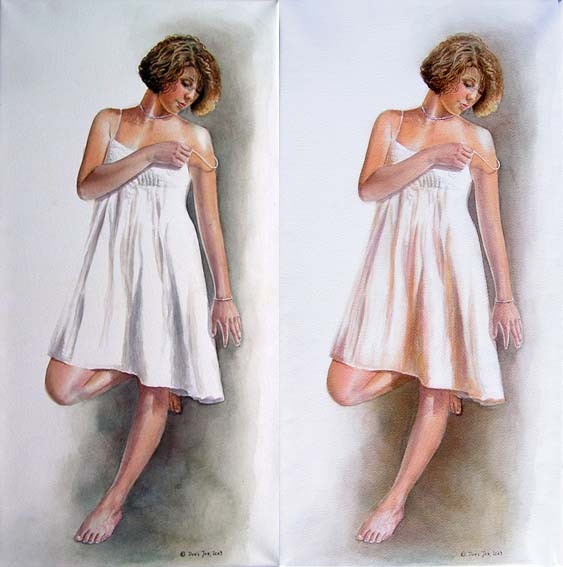 The real white in each of these watercolor paintings is the white of the paper. When we paint white subjects we only paint the shadows and the darker areas in the subject or the reflections from other surrounding subjects. 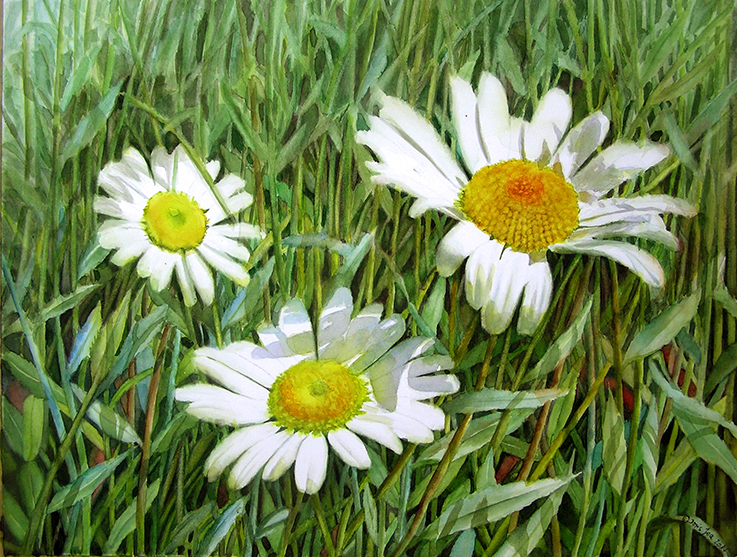 In the first picture, the Daisy painting, is a lot of white paper to see because the small petals are mostly all flat. You see colours there when the petals turn away from the light. And of course the petals which are affected with shadows got some colours. I used mainly green, blue, yellow and a touch of red to paint the shadows. In the second picture I also used blue and made some purple (mixing a red and blue) and I also used some yellow on the petals. But the painting looks really cool. It is a cool white rose with a lot of blue and blue-purple in this painting. Now to the third picture. This rose is bathed in sunlight. These shadows do really sing the sun song, they are dancing on the petals. For these shadows I used a warm yellow, some orange, a mix of blue and red (favouring the colour red) and also some green. 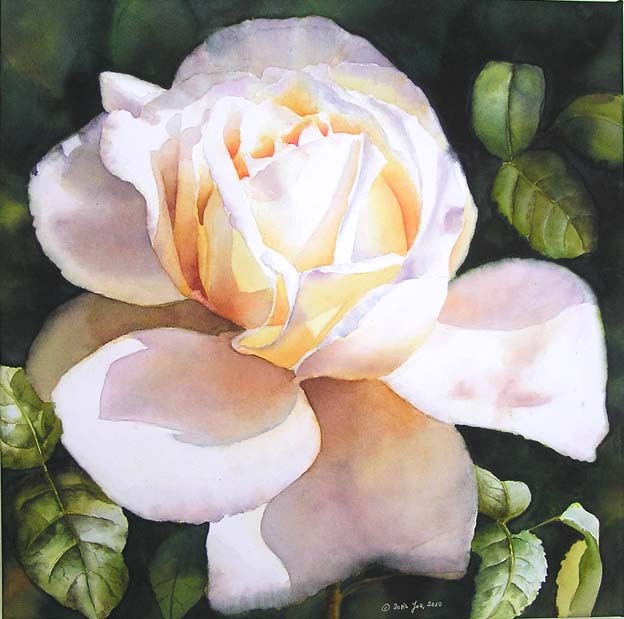 The shadows are all warm and so it makes the whole painting warm and completely different to the cool white rose. But I love the cool white rose the same as I like the warm rose. 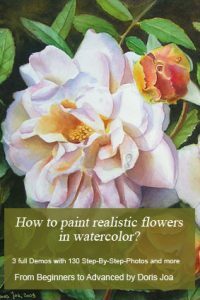 My Watercolor DVD about the white rose gives you much more support for painting whites. And here are two photos where I can show excactly what happens when we change the cool shadows to warm shadows. When painting my beautiful model I wanted to portrait elegance, grace and soft femininity. Unfortunately I painted the shadows too grey, there was too much blue added in the shadows. 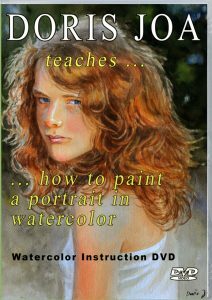 Although the skin tones, the hair and her pose looked great – the painting didn’t look so as I wanted to have it. I decided to change the colours on the dress. 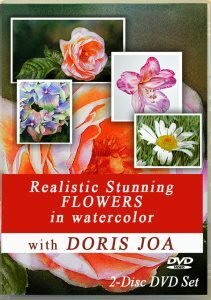 I simply painted over the greys using yellow, orange, red and purple and was amazed with the result. Also I warmed up the background colour. In this painting the warm colours are more appealing and they describe perfect what I wanted to say. Important is to note that we safe the white of our paper when we paint white. It is also important to remember that we only paint the shadow areas. We can create warm and cool shadows and the painting then describes different emotions. 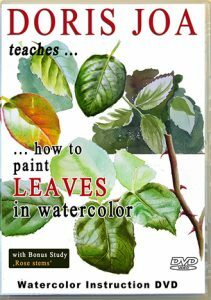 Don’t miss the lessons about painting pink, painting darks or painting greens for leaves. Learn more about Colour Mixes in my Free Watercolor Lessons Section. 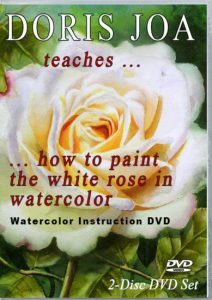 For indepth instruction on how to make a white rose glowing have a look at my Watercolor DVD about painting a white rose.